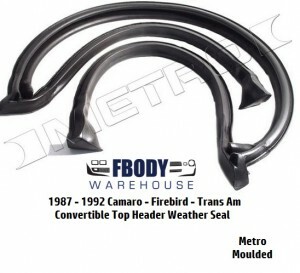 This is a new replacement 1987 – 1992 Camaro Firebird Trans Am Convertible Header Weather Seal. Unit is produced by Metro Moulded and offer a 15 year replacement warranty! Prevent wind noise and water which will cause rust by replacing these seals in minutes at home! Worldwide Shipping is available use the drop down box to select out of country shipping option.